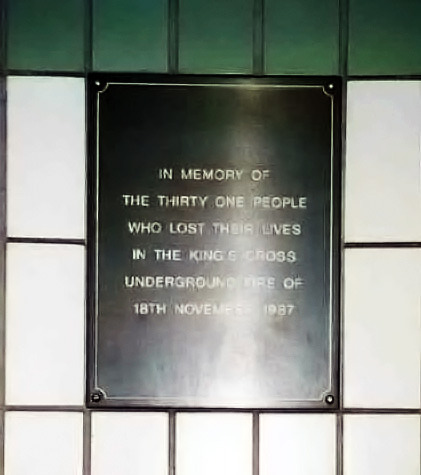 On Nov. 18, 1987, a flash fire engulfed an old wooden escalator at the King's Cross underground station. Thirty one people perished in that disaster including a firefighter - Colin Townsley, station officer from the Soho Fire Station in central London. Two other firefighters were trapped on the station platform - at the bottom of the escalator - but survived. ``The thick hanging smell of the fire lingered in the tube station passageways for months afterwards,'' commuter Andrew Pryde told the BBC. While inspecting an undamaged escalator, forensic investigators found charred wood in 18 places beneath the up escalator, which showed that similar fires had started before but had burnt themselves out without spreading. All these combustion points were on the right hand side, which is where standing passengers are most likely to light a cigarette: passengers stand on the right to let walking passengers pass on the left. Smoking had been banned for two years there but investigators found this was generally ignored by commuters. 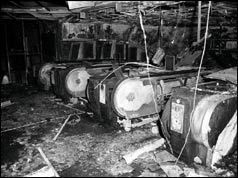 The investigators found a large build-up of grease under the tracks, but it was believed it would be difficult to ignite and slow to burn once it started; however it was noted that the grease was heavily impregnated with paper fragments from discarded tickets, sweet wrappers, fluff from clothing, and human hair and rat hair; records showed the under stair tracks had not been cleaned since the escalator was constructed in the 1940s. A test was conducted where lit matches were to be dropped on the escalator to see if this was the cause. With firemen standing by, the first match dropped ignited the grease and began spreading. This fire was allowed to burn for seven minutes, then extinguished without providing any evidence for why the fire flashed over although the fire replicated the initial eyewitness reports up to that point. The investigators next enlisted Oxford University to make a computer simulation of Kings Cross station. In the early stages of the modelled fire the flames lay down in the escalator rather than burning vertically and produced a jet of flame into the ticket hall. While the end result matched the tube fire exactly, the simulation's depiction of the fire burning horizontal to the 30° slope of the escalator was thought impossible and it was believed the programming was faulty. The next step was a scale replica of the escalator, built with the same materials, which was constructed on vacant farmland. The fire was lit and after seven and a half minutes of normal burning the flames lay down as in the computer simulation. 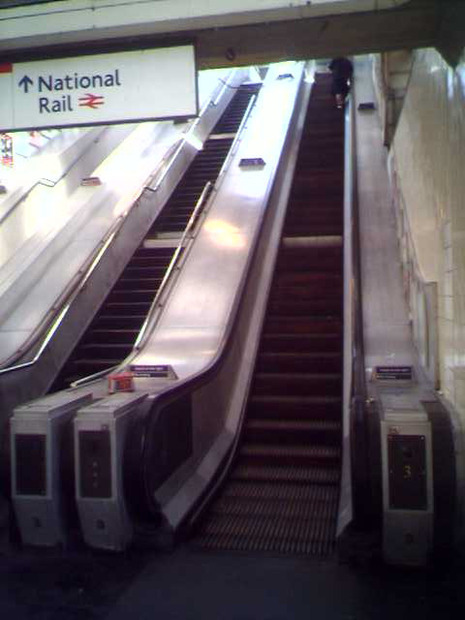 The metal sides of the escalator also served to contain the flames and direct the temperature ahead of the fire. Sensors indicated that wooden treads for 20 feet in front of the flames quickly reached between 500°C and 600°C. When the treads of the escalator flashed over, the size of the fire increased exponentially and a sustained jet of flame was discharged from the escalator tunnel into the model ticket hall. The arrangement of the underground hall and escalators functioned all too effectively as an incinerator due to heat driven convection added to the usual ventilation system, with temperatures reaching 600°C: a BBC television news report called Kings Cross underground station "an efficient furnace". The 30° angle of the escalators was discovered to be crucial to the incident and the large number of casualties in the fire was an indirect consequence of a combustion phenomenon that was later named the trench effect, though this phenomenon was completely unknown prior to the fire. The fire was exacerbated by a solvent-based paint used on the ceiling above the escalator, which ignited during the flashover, causing the composition of the smoke to change from light and thin to black and oily.